This is a valid question considering the numerous LCD optical enhancement and bonding services flooding the market. Following is our “Top 25 List” of what makes General Digital Optical Bonding Laboratories stand apart from the imitators. Also, we would like to mention how grateful we are for our loyal customers’ referrals of friends and associates to General Digital Optical Bonding Laboratories. 1. All services are performed on shore in the U.S.A.
2. A highly trained and tenured production staff delivers quality and reliability in every product for our valued customers. 3. All critical processes are performed in Class 100 laminar flow benches (clean bench) to minimize contamination on display surfaces. 4. General Digital is a United States government registered small business. We are registered with the Central Contractor’s Registration (CCR) and the Small Business Administration (SBA). Our CAGE (Commercial And Government Entity) code is available upon request. Being a small business makes us agile enough to accommodate special requests. Other small businesses are often unable to fulfill special requests because of resource limitations and lack of expertise. Large businesses are often unwilling to fulfill special requests due to overhead and feasibility restrictions. 5. 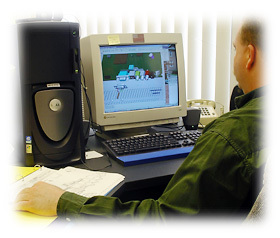 Our engineering staff has more than 60 years (combined) experience in characterizing and enhancing displays. Our design engineers can work with you during the engineering phase of your program to determine the best solution for your project. 6. Optical Characterization Laboratory with daylight simulation capability to enable taking performance data under harsh lighting conditions. 7. Enhancement of consigned LCDs, OLEDs, Plasma displays, or complete turnkey solutions available. 8. Ability to provide enhanced display components through finished, ready-to-deploy monitors. 9. Contract Manufacturing and private labeling available. 10. Small business mentality and infrastructure frees our engineering team such that they can quickly respond to custom requirements and design challenges. 11. Engineering prowess second to none. From Electrical, Mechanical and Optical Engineering to Software and Compliance Engineering, our talented workforce possesses the willingness and expertise to design systems and applications tailored to meet your specific requirements. This is not a comprehensive list, but a commonly requested one. 13. We offer a multitude of standard and custom enhancement products and services as well as options to suit ruggedized, specialized and customized applications. 14. Backlight Enhancement capabilities ranging from replacement of Cold Cathode Fluorescent Lamp rails, LED lighting solutions to full custom backlight design. Sunlight readable and Night Vision Goggle-compatible systems available. 15. Integration of LCD displays and optical/electronic components from multiple sources of supply allows us to offer our customers the best price vs. performance advantages. 16. Versatile enhancement options. AR film laminations to front of displays, optical bonding using multiple adhesives and bond configurations. 17. We possess in-house equipment for design, test and validation including temperature/humidity chamber, photometers, colorimeters, IR thermometer and thermocouples, and data logger. 18. 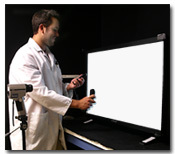 Video Microscope (5-30X) provides graphical documentation for thorough defect analysis. 19. On-site inspectors trained to IPC-A-610, Rev. C standards. 20. Quality control inspection is performed on 100% of product manufactured, not on a sample lot. 21. All enhanced displays are inspected to MIL-PRF-13830 80/50 scratch/dig criteria. 22. Attention and dedication to configuration control; the majority of our customers are government or Department of Defense related, many of whom require “frozen” parts lists or Engineering Change Notice approvals before acceptance of product modifications. 23. We manufacture both standard and custom products as long as the components are commercially available. 24. We continually monitor component availability and advise you on the short and long term availability of the components. We work to ease the integration effort of component changes and the timing thereof. 25. ...because we listen to you. Our passion is your satisfaction. We are a friendly, highly skilled and educated group of people who feel that our customers are to be treated the “old-fashioned” way—with respect and concern for their needs.